The Central Province sits higher up than the rest of Kenya, so it is relatively cooler. This makes the region perfect for growing coffee, one of the country’s prime exports. The area is very much an agricultural region, evident by the vast stretch of rolling greenery used also for growing tea, maize, rice, mangoes as well as grazing fields for cattle. The province is populated by the Mru, Aembu and Agikuyu tribes, who migrated here during the 17th century. During British rule, the Central Province was considered part of the “White Highlands”, an area which was exclusively used by foreign settlers at the time and was therefore a source of dispute between the foreigners and the native communities who felt they had an ancestral right to the land. There are a great number of beautiful places to visit in this region. One is the Mount Kenya National Park, a forest and wildlife reserve centred around the mountain that gave the country its name. Serious trekkers can scale Mount Kenya or explore the surrounding moorlands, which offer outstanding views of region. There are a lot of great places for camping in the park, particularly around Lake Rutundu, which sits on the northern slope of the mountain. Popular activities around the lake are trout fishing, horseback riding and bird watching. Another favourite stop for climbers ascending Mount Kenya is the equator town of Nanyuki. Visitors will note that the north side of Nanyuki is warmer and does not receive as much rain as its south side, where the climate and weather is more temperate, tropical and humid. 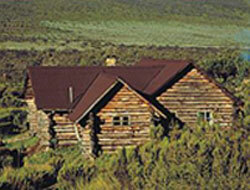 On the opposite side of Mount Kenya is the Aberdares, an old volcanic mountain range. The topography here is varied, parts of it very rugged with deep canyons, other parts with sparkling streams and thundering waterfalls that cut through forests. There are several wildlife sanctuaries in the area, chief among which is the Aberdare National Park. The giant forest hog, the mole shrew, the black rhino, and the leopard flourish in these protected forests, providing great entertainment from afar for visitors who come and do game drives and nature walks. One of the most popular places to stay in the Aberdares is the Treetops Lodge, which faces a water hole and a salt lick, thus making it a prime location to see animals from. It was at this lodge where the then Princess Elizabeth was advised of the passing of her father and thus her becoming Queen of England. Ol Pejata Conservancy covers 90,000 acres of land between the Mt. Kenya and the Aberdares and is home to Africa’s Big Five; the buffalo, the lion, the elephant, the black rhino and the leopard, as well as numerous troops of chimpanzees. Connected to Ol Pejata is the Sweetwaters Game Reserve, the largest black rhino safe house in East Africa. It profits so generously from wildlife tourism that the game reserve makes enough money to put back into wildlife conservation and the development of nearby communities. The Lewa Wildlife Conservancy is a large private sanctuary that is home to black and white rhinos, cheetahs, zebras, buffalos, elephants, lions, leopards, and ostriches. The Conservancy offers a number of activities for the adventurous visitor, including day and night game rides in open four-wheel-drive vehicles, cultural visits to neighbouring communities, horseback riding, hiking and camel riding. This is also the where the annual Lewa Downs marathon is held, a grueling run done at a 3,000-metre-high altitude and attracting serious marathon runners from around the world. Lewa has partnered up with a Samburu community nearby to run the Namunyak Wildlife Conservation Trust, a smaller conservation area that offers walking tours with local Samburu game scouts as guides. At the Kiamaina organic farm on the slopes of Mt. Kenya, visitors can see how traditional forms of farming are done. This includes coffee husbandry, bee-keeping, dairy, poultry and horticulture farming. Near the farm is Karatina Market, the second largest open-air market on the continent. The town of Nyeri lies at the foot of Mount Kenya. It is the capital of Central Province, but life here is nothing like life in Kenya’s bigger cities. Nyeri’s buildings don’t rise higher than 5 storeys, and the sidewalks are unpaved. Nevertheless, it is a favourite stop among tourists who come here to trek up Mount Kenya or visit one or both of the large natural preserves that flank the town—the Aberdare National Park and the Mount Kenya National Park. Nyeri is about two hours’ drive north of Nairobi, wedged between eastern base of the Aberdare Mountains and the western slope of Mount Kenya. The standard of living is relatively good, and the cost of living is quite low. The water is plentiful and safe to drink, and the town has electricity and Internet services. Nyeri is quite a busy town day and night. At night, the pubs open for business; over Kenyan beer, friends gather to socialize and watch sports on TV. The founder of the scouting movement, Lord Robert Baden-Powell, was laid to rest here with his wife. His cottage is now a museum, and a popular area of interest. On the outskirts of town there are also several large, private ranches where wealthy tourists and international celebrities have stayed.